Saying ‘thank you’ is giving of thanks and it is much more than two words that we add to an end of a sentence to be pleasant when we receive something. Giving of thanks is an attitude of gratitude that is an outcome of the source of thanks giving being right. From the Word of God in Ephesians 5:18-20 we learn that when we are Spirit filled, we will automatically give thanks to God. 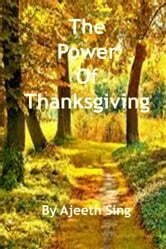 Giving of thanks to God is a heart attitude of gratitude that shows your love for God.